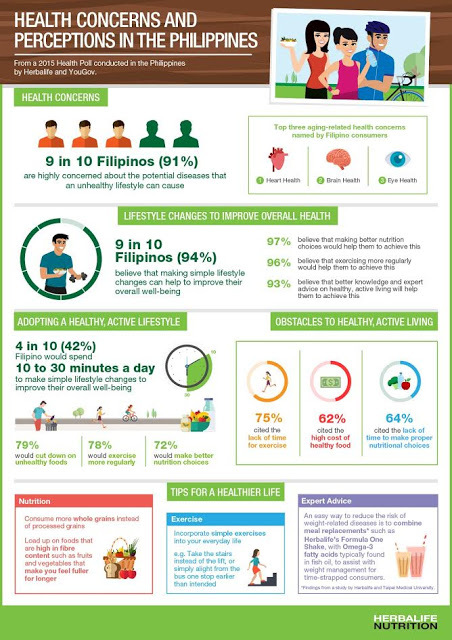 MANILA, Philippines - Nine out of 10 Filipino consumers surveyed by global nutrition company Herbalife are “highly concerned” about the potential diseases that an unhealthy lifestyle can cause them. With the same number of consumers, believing that simple lifestyle changes can help them improve their overall well-being. 72 % - said they would make better nutrition choices. The respondents, however, cited the following as the top obstacles to achieving a healthy lifestyle: lack of time for exercise (75 percent), lack of time to make proper nutrition choices (64 percent), and the high cost of healthy food (62 percent). The same health poll likewise showed that the top three aging-related concerns in the country were the heart, brain, and eye health. 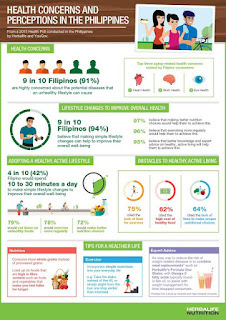 Herbalife conducted the survey in September 2015 in the lead-up to its Asia-Pacific Wellness Tour. It surveyed 1,200 respondents across six countries, including the Philippines, on perceptions towards their current health and lifestyle. Respondents from Australia, Indonesia, Malaysia, South Korea, and Thailand were likewise included in the survey. Herbalife is a 35-year-old global nutrition company that sells weight-management, nutrition, and personal care products intended to support a healthy lifestyle. Herbalife products are sold in more than 90 countries to and through a network of independent members. The company supports the Herbalife Family Foundation and it's CASA Herbalife program to help bring good nutrition to children. To learn more, please visit the website Herbalife.